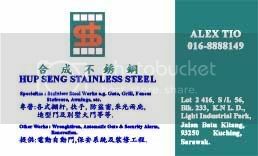 Address: LOt 2416, S/L 56, Blk.233, KNLD, Light Industrial Park, Jalan Batu Kitang, 93250 Kuching, Sarawak. Detail: Stainless steel works e.g. gate, grill, fences, staircase, awinings,etc. Wroughtiron, automatic gate & security alarm, renovation.